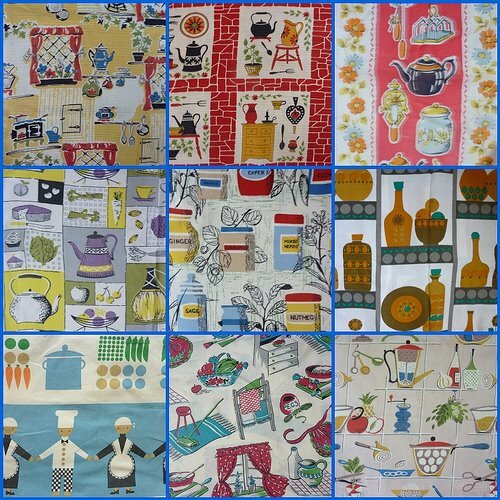 I love bold, strong graphics - I made this little montage of some of my kitchen fabrics last year. 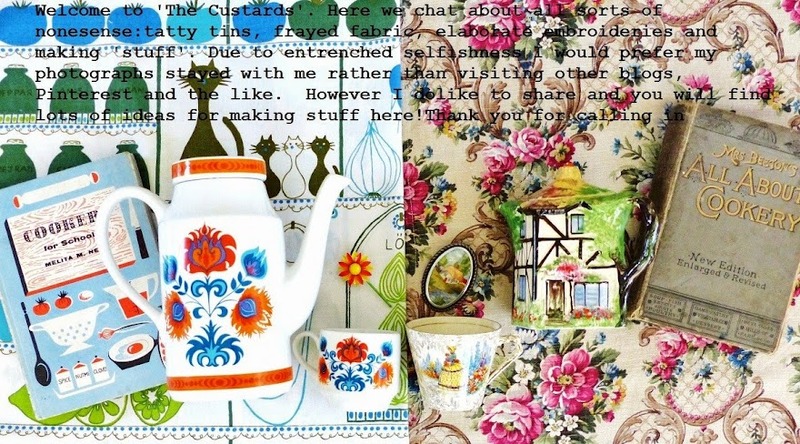 Fabrics with motifs from daily life are a particular favourite (see peg bag from earlier this year here: http://thecustards.blogspot.co.uk/2012/02/peg-bag-season-est-arrive.html). Can I say here (again) that photos from my last two posts have already appeared on Pinterest and I have now filed copyright forms... what a sad state of affairs really. Oh Claire - I must sound a right misery guts! Everyone takes a slice I guess and I have had plenty of lovely bargains over the years - I have also have my fair share of taking forever to make something that sells for 4.99! Thunder and hail down here today!! Hope that it is better up there! If you do decide to sell any of the above fabrics, could I have a bit of the one top left, to buy of course. Great vintage fabrics Jenny... Well I for one am just pleased that you found, stored and enjoyed all these fabulous things otherwise they may have all been lost to the big landfill in the ground and that would be very sad indeed. Thank you Cass - sadly you will not be finding me on Dragon's Den!! First row in the middle.. Do you know the manufacturer for that fabric?